<The website is online in September 2018>Northern Knowledge is platform for Knowledge, Valorisation & Entrepreneurship for the joint universities in the north of the Netherlands. He developed a program for more cooperation in the Quadruple Helix. Make connections, show and tell what the social economic impact of all the cooperation, projects and research on the region. Northern Knowledge supports and stimulates the process of cooperation. Before this Albert was program director of the Frisian Design Factory, an initiative and part of the NHL Stenden University of Applied Sciences. Their motto: “We design the future, together”.The FDF is situated in an old monumental jail in Leeuwarden. It is a key partner in the Design Factory Global Network. Their activities focus on Design Thinking & Open Innovation as means for solving multidisciplinary, complex matters and nowadays questions in co-creation with companies, governments, students, citizens and activists. Their starting points are the Unesco Global Goals.What Albert loves is design and to develop new environments, new concepts in which people and organizations learn and develop themselves to create a new valuable future. He has initiated a project called IslandCQ, a project in cooperation with the local governments in finding new ways of sustainable tourism for the isles in the Wadden region (2010). It evolved in to an international exchange project with partners from Finland, Belgium, Latvia and Hungary as a platform for the debate about matters like Europe, privacy and sustainability.Albert developed several new bachelors: Communication Multimedia Design and the Academy of Pop Culture. Both situated in Leeuwarden, both belonging to the avant-garde regarding their educational concepts. 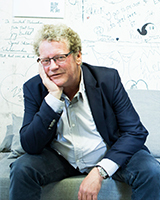 Besides that he is Chairman of the Board of Media Art Friesland and Chairman of the Board of Production House for Pop Culture Friesland.His specialties: innovation, sustainability, pop culture, media, education, networking and strategy.